Designed by a former F&I Manager and many, many Sales Managers. Profit-Focused F&I and Vehicle Inventory – Accurate Deal Processing and Inventory Pricing Management. Restrict who can export/import. Prevent sales people from exporting your customer file. Restrict who can see and edit vehicle costs, pricing, and gross profit. Get notified each time a deal is added via email. Onboard Help with tutorials. Unlimited amount of trades, down payments, aftermarket items. Store wholesaler bids; who offered what amount for your trade-ins. Override sales tax rates and rollback payments. Enter the stock number and customer number and your deal is automatically added with default bank payment calcs, pricing, fees, and aftermarket. 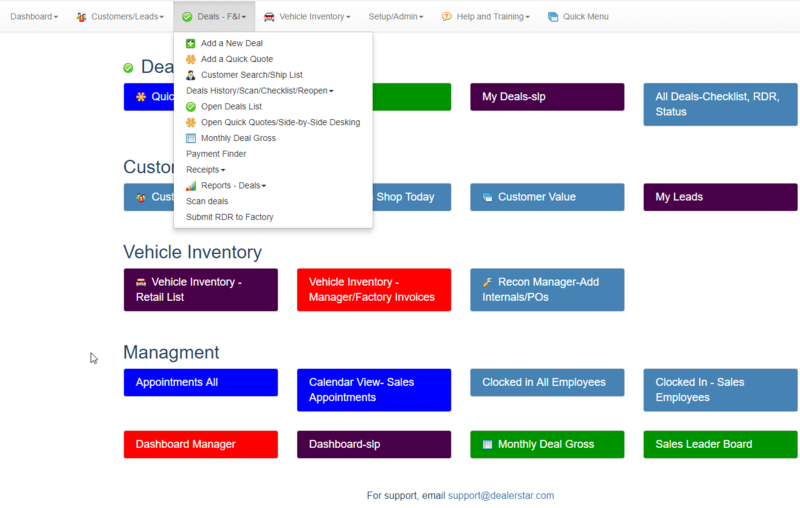 Make more profit with F&I menus and Vehicle pricing edit tool; update quickly the price on filtered vehicles. Big Red notice if you’re viewing inventory or editing a deal with an open recall.